Kanza Bodden won two silver medals in aquatics, teammate Quinton Ebanks earned two silver and one bronze in aquatics, while bronze medalswere won by Cindy Whittaker and Shanike Ebanks (both in 200 meter races). Eleana Ow won bronze in single bocce, and the bocce team eam of Matthew Ebanks, Cindy Whittaker, Shanike Ebanks and Andrew Hayles also placed fourth. The team was met by relatives, teachers, the media, well-wishers and government officials at Owen Roberts International Airport on Wednesday morning as they returned from Greece. Although off-island on official business, the minister with responsibility for sport, Mark Scotland, sent congratulations to the “national ambassadors”, as well as their coaches and supporters. I am very very proud of you guys; you ALL did a WONDERFUL JOB! … Keep it up you all made the people of Grand Cayman,Cayman Islands VERY PROUD! Well done! You deserve the Heros welcome and more for representing us so well! You all have a winning spirit! Congratulations! Well done! Had tears in my eyes watching you arrive home at the airport! Shining example of wonderful human beings and what somebody can do if they just try and work hard. You all make Cayman a happy place! Thank you! 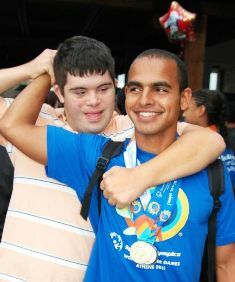 The photo also really captures the spirit of the games – many thanks CNS. Congrats team on a job well done you have all made us PROUD…………………… continue to shine. Congratulations to all the athletes. You made Cayman proud. Thank you to the family members, coaches and supporters.